OnlineFreeSpanish has nine activities to teach farm animal vocabulary in Spanish. The games combine an image, the written word, and sound. These are not whole language activities; they focus on individual words. Teachers and parents can make the most of these games by building a context, using the words in sentences, and relating the words to each other. Like the other games on OnlineFreeSpanish, the farm animal activities include pronunciation. The words are pronounced normally, then pronounced broken into syllables and then pronounced again. The written word is often on the screen and the syllables are highlighted. This is helpful for children learning the letter sounds and how to read in Spanish. 1. 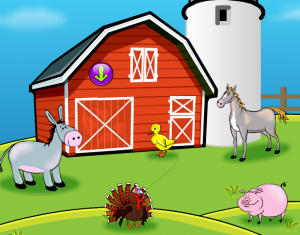 Farm Animals – This is an introduction to the vocabulary in the activities. Kids click on the animals to hear the sound it makes, see the word and hear the word pronounced. 2. Guess Who I Am – In this game, players identify the animal that they hear. They select from two, three or four Spanish words depending on the level of the game they have chosen. If they scroll over the choices, they hear the words pronounced, and when they select the correct answer, there is a picture of the animal. 3. Word Search Puzzle – Children can do these word search puzzles online or print them. Online there are images when they scroll over the words so that the meaning is clear without translation and the word is also pronounced. With the images and sound, kids learn much more effectively than with a typical word search. If you choose to print the word search, there are options for size, word direction, and printing a solution. Just click on the gear at the bottom of the puzzle. 4. Memory game – This is the classic game with Spanish farm animal vocabulary. Kids can choose the number of pairs they want to match. The words are pronounced each time a card is turned over. I like the memory games on OnlineFreeSpanish because even when children do not make a pair they hear the word. 5. Beenny’s Game – This game has scrambled farm animal vocabulary in Spanish. Children unscramble the words to move the bee through the maze. Players can click the speaker and hear the word pronounced, so it is good practice for writing a word based on the sound. There is an image of the word to reinforce the meaning. 6. Dunk a pingu – This is a really cute version of hangman. Kids guess letters to complete the farm animal word before the pingüino loses all of the ice and falls into the sea. 7. Click-n-Match – In this matching games, children pair a picture of a farm animal to the Spanish word. The English word is under the picture and it disappears when the picture is matched to the Spanish. 8. Matching – This printable activity consists of three columns: pictures, Spanish farm animal vocabulary and the vocabulary in English. Kids draw a line connecting the items in the three columns. There are options to print a solution, and to mix the content of the columns. 9. Coloring Pages – These printable coloring pages have pictures of farm animals with the words in Spanish and English.